Need a sugar scrub recipe that leaves your skin feeling fresh and renewed? Try our Lemon Sugar Scrub! 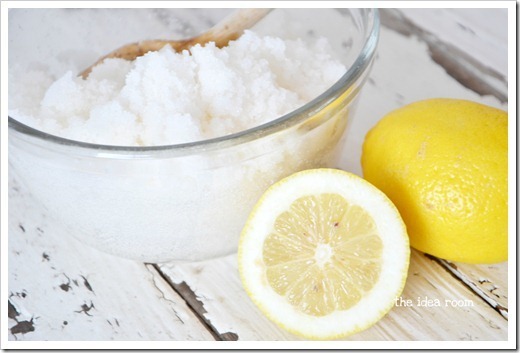 It’s the perfect DIY Sugar Scrub for tired skin! Great gift idea too! 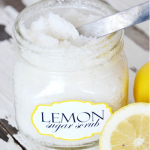 One of our all time most popular posts is this amazing sugar scrub recipe…Lemon Sugar Scrub. This Sugar Scrub Recipe is so easy to make. Sugar scrubs leave your skin feeling so soft and smooth…and also leaves your skin smelling amazing! Using a sugar scrub is the perfect way to refresh and rejuvenate tired, dry skin! This sugar lemon scrub is really so amazing and feels so decadent and expensive. This makes your feet so soft and makes them smell so good. Perfect for those summer time feet. No one will be the wiser that it was so easy and inexpensive to make. Those are the best kind of gifts to give…am I right? Need a sugar scrub recipe that leaves your skin feeling fresh and renewed? Try our Lemon Sugar Scrub! It's the perfect DIY Sugar Scrub for tired skin! Great gift idea too! Mix together two cups of white granulated Sugar and a 1/4 cup to 1/3 cup Almond Oil (Coconut Oil will work too). Add the oil slowly till you have a nice soft consistency that is soft but not too oily. Add a few drops of Lemon Essential Oil. Scoop the mixture into a pretty jar. Store for up to three months in an air-tight container. Only scoop with a spoon or clean hands to prevent contamination. Rub on dry and tired skin to freshen. Gently scrub skin and then rinse with warm water. Scoop the mixture into a pretty jar. And keep it all to yourself. Or…if you are the sharing type…which sometimes I am, gift a jar of Lemon Sugar Scrub to your mom or one of your best girlfriends! They will love you forever! Want to learn more about the benefits of Lemon Essential Oil? Check out our post all about Lemon Oil and other recipes using doterra lemon essential oils! Looking for other Sugar Scrub Recipes? I made sugar scrubs labels into a printable pdf so that you can print it some out for your own use. 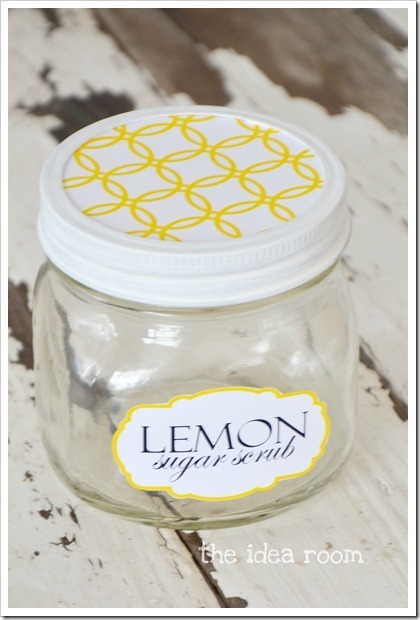 Simply print on white card stock and cut it out and glue on the jar with a glue stick. These Sugar scrub labels work like a charm. If you would like to download the FREE printable(s), you can sign up for my newsletter in the widget below. This will give you exclusive access to FREE Printables, recipes and more! These will be made available just for those who sign up to receive The Idea Room Newsletter! Upon confirmation you will receive an email containing a link to the download page and a password to gain access. This is where you will be able to grab all the printables I share. Check back often for new additional printables! *As always, these labels are provided FREE for your own personal use. Please do not sell them on your sites, etsy stores, etc. or share them with friends and family. Send friends and family here to download their own labels. Thank you! It can be confusing to know where and what brand of essential oils to buy! After a lot of research and study and going through asking some questions to determine the Best Essential Oils Brands, I made the choice to go with DoTerra Essential Oils. I couldn’t be happier with the quality and the purity of the oils and want to share them with you! Buy Single Essential Oils here or Essential Oil Blends here or simply click on the BUY NOW button under the image of the Lavender Oil Bottle. If you want to just buy some oils, you can become a wholesale customer and be able to buy the oils at the wholesale price. Or you can sign up to be a wellness advocate and be a part of my DoTerra Team! We would love to have you! Simply message me here ([email protected]) and we can get you signed up! Step 1: CLICK HERE, and fill out the About You section. Step 2: Select your wholesale starter kit (US kits). Select “Wholesale Customer” or “Wellness Advocate” (can share/sell doTERRA – will get a free website to share with others) and then hit continue. Step 3: Add any other items to your order if needed. Step 4: Input your contact and shipping info. That’s it! 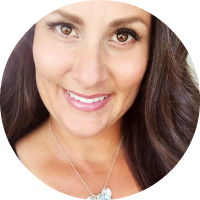 Excited to have you on our team! *The information provided on this website is not intended to diagnose or treat any medical or mental health condition. Please consult your healthcare provider. I share personal ways we enjoy using essential oils. **edited and updated to include more information and answer frequent questions! I made the labels with my silhouette CAMEO. I have the file if you would like it. Hey Amy, I would love the file. I don’t have a silhouette but could I just use it to print off and cut out myself? Ange, the link is in the post near the bottom. You should be able to click on it and download it and print it from there. If you have trouble let me know! Thanks! Hi, I also am trying to download the labels, but it isn’t letting me. Is there any way you could have them in a PDF form like the peppermint candy cane ones??? Hi there. I have a quick question. I am going to be filling 18, 8oz mason jars with this scrub recipe and was wondering how much I should make at one time, or should I make the standard amount that she has above and just see how far it get’s me each time? What do you suggest? Hi, Can you send me the label please? I am looking for the lemon sugar scrub label? Can you send it to me please. I tried to download the labels and could not, could you please email me it? Hi, could you send me the file for the label you made? Thank you! hey Amy can i have the file for the labels? Are you using regular jam jars that have the two-piece lids? If so, did you glue the inner lid to the band? Hi there! I love this idea and am going to have a craft party with my mama girlfriends….I was trying to download the labels but the .studio is not downloading. I have a mac and apparently there is not an application that can open that kind of file. Is there another way of getting it? This looks amazing. I wanna try it and make my hubby give me a foot treatment, haha. He used to do that back in the day. I’m sad we didn’t get a chance to chat during SNAP although I totally understand how busy you were! It was a great conference. Also what are you shooting this scrub on? I love how distressed it is! I know! Thanks Heidi! Wish we could have chatted! I took apart an old swing that was at my house when we moved in. Then I just made a slab of wood out of it for pictures. I will share the tutorial here shortly :) Thanks! I love making my own sugar scrubs. You’ll have to try using Citrus Bliss (also doTerra) in another scrub. It smells SO good! I LOVE Citrus Bliss! I will for sure have to make that one next time! Or a lavender one before bedtime!! I just stumbled on this and can’t wait to try it. Can you please tell me more about the scents Citress Bliss and Terra? I am totally new to this, as if you hadn’t guessed. Also, I would love the information on printing the label. Thanks so mch for sharing! doTerra EO’s are a brand name and only available to purchase through someone. Citrus Bliss is one of their blends. This looks like a great springtime/summer gift for girlfriends. And your photos are amazing! Awww…thanks Emily! You are so sweet! These look fab – I love sugar scrubs so def’ going to give these are go. How long do you think they’ll keep in the jar ? I’ve got some rose aromatherapy oil think I will try that one too. I have had this for over a month now. Just got around to posting it and there is still some in the jar. It still smells and works like new. It has been sitting in my office too. It is my understanding that essential oils have a “preservative” power. With Almond oil you will know when it has gone off. I would say probably 60 days is best for the freshest fragrance and the integrity of the ingredients. Keep in the fridge in warm climates as it will break down faster in the heat. Coconut Oil however should keep for 3-6 months in the open. Don’t know if you will “know” by smell when the Coconut Oil is off…. I love this, so funny that I have been researching recipes for natural oil based beauty products andwith this pops up onthe my news feed. This will make a wonderful Mothers Day gift! Lemon is my favorite pick me up! I know right?! Hope you have recovered from Snap! Oh I want to try this. I love all thing’s lemon! Thanks Kirstin! So good to meet you this weekend! LOVE me some citrus too! I am anxious to try this. Are you able to share the printable for the label – love it! I will try to get the label up as soon as possible. It is a silhouette file. Perfect for Mother’s Day!!! looking forward to the Silhouette file! Do you have a link to those cute labels? I would love to make these for gifts, and the label makes it sooo cute! Thanks Kate. Send me an email and I can get it to you. I will try to get a link up to the file as soon as I can get to it here on this post. Hey, I’ve tried printing the labels off for this lemon sugar scrub, but it’s not working. Is there anyway you could email it to me?? Thanks :) love this and plan on making as a new baby gift for my sister. Thanks so much!! I would also love to know where you got those cute labels? We are hosting a mother daughter event and I would love to make these as favors. I have the labels as a silhouette file. I can send it to you if you would like. Just leave me a comment or an email. Can you use lemon juice instead of essential oil? I personally would not use the lemon juice. The essential oils are so nice for your skin and the shelf life of them is a long time. I would worry about the juice turning the sugar rancid. Very cute! Can you tell us where you got your cute jar? The jar is just a short mason canning jar. Just covered the embossed name with the label! Do you know the size of the small mason jar? Love the labels also! Where did you get them? Hey Amber! I made the labels with my Silhouette. I have the file but it is an svg file! You can have a copy if you would like. Would love to have the file for the labels. I am working a fishing tournament next week and am definitely going to make this and give away. Thanks!! So cute!! Can’t wait to try it! Can you please send me the file for the labels? Bummer, I don’t have a Silhouette. I was hoping it was a printable. I still have not learned how to change a silhouette file into a pdf for everyone to use. If anyone knows how I would love to know. That way I can share it with everyone and not just silhouette users. I know many of you don’t have them. Have you figured anything out??? Amy-I would like to try the svg label file. 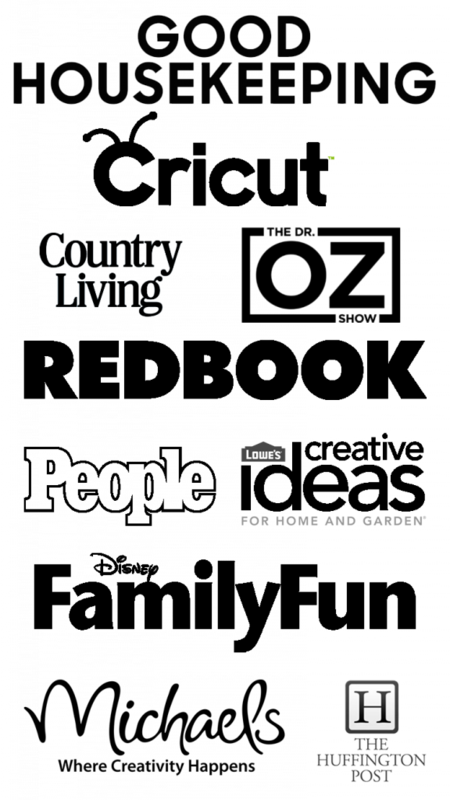 If I can convert it for you I will send it back in a pdf format. Thanks!! Hi Amy, would you be able to just print screen the svg file? So at least it would be an image file. I am in love with this idea and can’t wait to try it! Could you also send me the file for the cute labels? Hello first time here. Love ur blog. I am obssessed w/scrubs. I use them everyday in my underarm area. I don’t like dark underarms nor the residue of the deororant. I’ve heard lemon & baking soda are good to lighten those body parts that tend to be darker, like our knees, elbows etc. I wonder if this scrub is the way to go?! Thank You! Sorry for the long comment. How do you use Coconut Oil as it is a solid below 75 dgrees? Thank you. That is a great question. You can warm it up in the microwave just a little bit or run the bottle under warm water. Then when it is liquid you can mix it with the sugar. It will harden when not in use. But you will be able to scoop some out and it will warm in your hands and then you will be able to use it as a scrub! 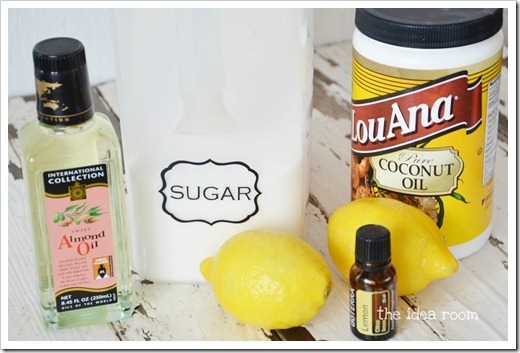 I love homemade sugar scrubs and this look perfect for summer and Mom Amy!! 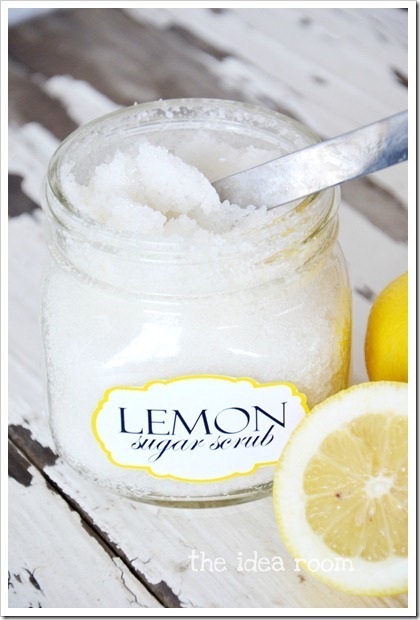 Your pretty lemon sugar scrub is perfect for a small summer fun basket I wanted to give to some friends. What great timing! Thank you for sharing! Where did you get the cute little jars? I love them, and where did you get the cute labels. I didn’t see where to download the labels. I used this as inspiration to make my own scrub: check it out! this is SO cute! i’m going to make these as part of the gift bags full of wine, yummy snacks,and other things to pamper themselves with that i’m giving to my bridesmaids! do these have a somewhat long shelf life? i’m sure they’ll just need to be stirred up right?! Perfect timing! I’m going to make this for my mom for Mother’s Day. She gardens a lot so it will be a perfect remedy for her hands, thank you! Where do I buy the essential oil? I really want to make this but can’t find a place that sells them. I get mine at a grocery store near us in the natural foods section. I’ve seen them for sale on Amazon too. Probably Whole Foods would have them if you have one near you. Love this! Thanks for sharing. Where did you find your scoop? Looks so good, and I’m sure it feels (and smells) even better!! Gonna try it!! Thanks. And beautiful pictures! I am so tickled to find a recipe for a something I’ve had on my list to buy! Thank you! I can’t wait to make it! What else can you use this for? Recipe looks awesome! Found you on pinterest. In regards to the labels… I have no idea what a silhouette is, but if you can print from whatever program you use to make them, try this. Download and install the free program “cutepdf”, it installs as a virtual “printer” on your computer. In your program you make the labels with, go to print them, select “cutepdf” as your printer, pick a place to save, and you’ve got a .pdf to share! I love that little tool, hope it works for you! does anyone know of a really good face scrub? I use a facial scrub from Indigo Wild. After reading this, I’m thinking about trying to make a facial scrub too. It has sugar, some type of oil and a few essential oils in it. Love this idea, went out today to fetch the ingredients, however, I was unable to find Almond oil, I did find the coconut oil, I’m assuming that you use the same amount as the almond oil? also, I didn’t find just lemon essential oil, instead I found lemongrass. I hope these ingresients will still work together. I am excited to make this for mothers day and teacher appreciation week. Thanks for the post! I’m going to try to make this for my step-daughter’s birthday party this weekend. She wants a lemon/lime theme, so I’ll use these as favors for her friends! Fingers crossed it comes out good! I love the lemon idea!! I’ve made different versions of this over time. I use it to shave my legs. It exfoliates so well and leaves your legs smoother than anything I’ve ever tried!! You just scrub it on your legs, shave, rub more on yours legs and shave one more time and it gets rid of the dead skin cells. Hi! Love these…so cute! Is it just foot scrub or can it be used on your whole body? hia great easy idea, would frshly squeezed lemon work as well as essential oils?? or will it not keep as long? Hello, I love this idea and thinking about making this for all my little ones teachers as Christmas presents. How long is the shelf life? If I made it now would it be okay mid December? Thanks!!! Hi there, I was just wondering where the best place/temperature is to store this scrub is? Because of the oil I wouldn’t want to keep it in the fridge. Will it get moldy if I leave it at room temperature? i hav tried the coconut oil,but it semms it gets hard.do u hav any suggestions? Coconut oil turns into a solid around 70 degrees..Room temperature. So you could still use it and then warm some up in your hand. It should loosen up when it gets warmer. Or you can put the jar in warm water to warm it up and it will become more liquid. I really like the Coconut oil though!! Or if it bothers you and you want it prettier you can use a different oil such as almond Oil. Coconut oil will form a solid at about room temp. So you can use it it just may look a little more clumpy. But once you warm it in your hands, it will soften right up. Coconut oil is really good for you. I would expect it to last for a couple of months if sealed properly. Make sure to clean hands before touching it so you don’t leave bacteria on the jar to grow!! Can you tell how to use the scrubs you post,thanks. I would also like to know how to use them. You said you put on a tag the scrub – needs to be refridgerated, what all do you put on your tag when giving away? Could you use lemon juice instead of the essential oils? Would you mind sharing where you got that jar? I love the shape and size!! Perhaps you could try her suggestion, and then you’d be able to have the labels in pdf format. Yes! Put the instructions. Basically it is a scrub to use in the tub or shower or at the sink for your hands. Anywhere you want softer, smoother skin. Refrigerating will just make it last longer. A few weeks out should be fine. Thanks. It helped me come up with a poem. to use in the shower or the tub. Use it in the sink. Want your skin smooth and soft? Then use this scrub oft. Keep the rest of me in the fridge. Can you add any essential oil?? Thinking of personalising them for Christmas presents! Essential oils would be perfect to add!! Thank you for the excellent recipe. Is lemon essential oil the best to use given it is phototoxic? Can you use real lemon juice instead? It should be fine. Not sure if it will be sticky. You could test it out on a little bit first. I would refrigerate it though as I am not sure it would have a long shelf life. What a FAB idea! Unfortunately I’m unable to download your label (my Mac has issues), any chance you can email it to me? Pretty please with lemon sugar scrub on top? Lol thanks! HI , I made the Lemon sugar scrub and am unable to print the label can you e-mail it to me? LOVE this! I’d love to make them this holiday season! Where did you get the cure jars? All I can find are mason jars but the ones you used look great! Also, I’m unable to download the label, can you email it to me? Love your blog! Thanks for the ideas, made perfect xmas gifts. Love this idea, can’t wait to try it. Thinking of making it as a gift favor for my sister’s birthday. Could you send me the file for the labels? I love your lemon sugar scub recipe! Would it okay to be used as a face scrub as well? Hi! I’m loving this scrub. I just whipped up two batches and am excited to give it as gifts. I used grape seed oil and added a little lemon zest in with it to give it a little color. Can you use lemon extract instead of essential oil? Where can I find essential oil if not? Thanks for the great idea! Im a big fan of all of your work.I decided to make a salt based version, and give it a try! Also, gave you a shout out in my blog! Keep up all the great work! Since my son is allergic to tree nuts I am pretty sensative to other people’s potantial allergies so I will just use EVOO , but I will be adding Vitamin E Oil and lemon Essential oil as well. Can’t wait to make these for the teachers for Valentines day’s. Any chance you where able to turn the silhouette Cameo into a PDF.? Can you send me the label file please. Love your ideas, especially the lemon scrub one. I was trying to download the labels however nothing is coming up. Would you mind emailing me the template or label to print? Yay! I am so happy you have been able to use it. Hope you are enjoying it! Thanks for coming and sharing that with me. Do you have another version of the file for the labels? They are adorable, but my computer won’t let me open it because it is a STUDIO file. I’m not sure what it means. I even tried downloading a program my computer told me to download to open it – still wouldn’t open! The labels are so cute and I want to use them!! Can’t wait to try this! Can you please let me know how many jars this recipe fills and the size? Also, I tried to download the label using your link but was told windows couldn’t open it???? Is there another way? Made this last night with my teenage daughter. We used coconut oil and a few drops of lemon essential oil and it turned out wonderful! We’ll do lavender next time. Thanks for sharing. I find the best way to store it is in an air tight container like a jar. The shelf life should be about three months if you are using high quality essential oils. Storing it in the refrigerator can extend the life a couple more weeks. I made this sugar scrub for my mom and mother in law. They cannot stop talking about how wonderful it is. Thanks for the amazing Mother’s Day gift! So happy to hear this Elizabeth. It is one of my favorites to make for myself too! Thanks for coming back and sharing that with me! You could easily use the bigger raw sugar granules if you are worried about the detox effects of salt. It would work pretty much the same to substitute them out for salt in the recipe and I don’t think it would mess anything up recipe wise. As far as the coconut oil goes, it melt at about 75 degress F so any warm water down the drain should wash any residue of the oil away. I don’t think it would be anything to worry about pouring down the drain. Great questions! So glad you found what you were looking for! Hope you enjoy them! Can you put lemon squeeze or do you have to buy the essential? I feel like you get a much better product and results using the essential oils. It also increases the shelf life. Would you please e-mail me the adorable labels you used. I can’t wait to make this and give it as gifts. Thanks so much. I would love to make this scrub, but is this strictly for feet? Is there any swaps i can make in the ingredients to make it work for the face? Can you email me the labels? I am not able to open them from the link. Thank you! how do u use these? they look great! They are mainly used in baths and showers. Use a small amount and rub on skin. Leaves it feeling smooth and soft. This is the cutest idea. I would love your label file if you would email it to me I would Soooo appreciate it. 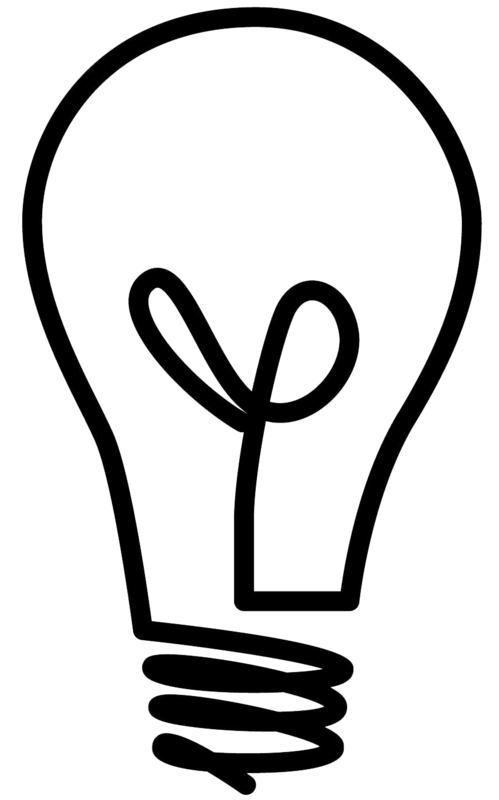 You’ve got amazing ideas! Mine is coming out yellow, not the pretty white shown in your picture. I have never seen clear sweet almond oil. Did you use coconut oil for the example in the picture? I love how it feels. Mine came out yellow, not the pretty white shown in the picture. Was coconut oil used for the picture? Also, any chance I get you to email the label? I really want to make this for my mom for Christmas and I was hoping you could please email me the labels! I love them!! Thank you! Thank you for the wonderful idea and ingredients to make this lemon scrub! This is my first time making it. I had coconut oil on hand so I did not use almond oil. I also put part of the scrub in a plastic jar and one in a glass jar, both that I bought from the dollar store. The scrub in the glass jar seemed to keep its consistency where as the one in the plastic jar got hard in between each use. I don’t know if it was just a coincidence, so I am going to ask you…what do you think? I want to make them as gifts so I want them to turn out nice. The only reason I used the plastic jar was because it was going to be used by kids and I was afraid they may drop it in the tub and I didn’t want glass all over should they accidentally drop it. Again…thank you for your ideas!!!!! Can you please email me the printable labels for the lemon sugar scrub? I cant seem to print them off. the file wont let me download them. please email me asap. I have made the concoction for Christmas gifts so all I need are the cute labels. Hi there. I was wondering. I would like to make these, and I’m curious whether or not i can make a large batch of them and then separate them into smaller batches to put different oils in them. Basically what i’m saying is will the general recipe work for any of the scrubs, and i can add in what ever kind of essential oil i’d like? Yes! That is a great way to do it. It is just a basic recipe that I add to when I want something a little different. That way you can make a bunch of different scents. I have never used essential oils in anything. Where can i find them to buy them? ( Hopefully locally!) I want to make this scrub for Christmas gifts, last minute I know!! Thanks! Great tip! Going to make a Lemon sugar scrub this week with my oils. Thanks! I tend to not do things for myself BUT this sounds AMAZING!! Could you tell me exactly how you use? Do you put it on and let it sit or do you just scrub your feet? Thanks! You use it as an exfoliating scrub. Rub it on wet skin for a few seconds and then wash off with water. Leaves skin feeling smooth and soft and smelling yummy! If I was to use coconut oil for this would I have to melt it in a microwave?? Hi! I love this idea and was going to make it for my mom for mothers day! :) I was wondering can you use lemon extract or orange oil instead of lemon oil? Unfortunately thats the one thing I don’t have. Please let me know. I happen to have apricot oil on hand and was wondering if that would work for this scrub? TIA! It should work just fine! Amazing scrubs! I made the chocolate sugar body scrub and the lemon sugar face one, and I was wondering how long can you store them? They should be good for up to 3 months in an air tight container if you used quality oils! 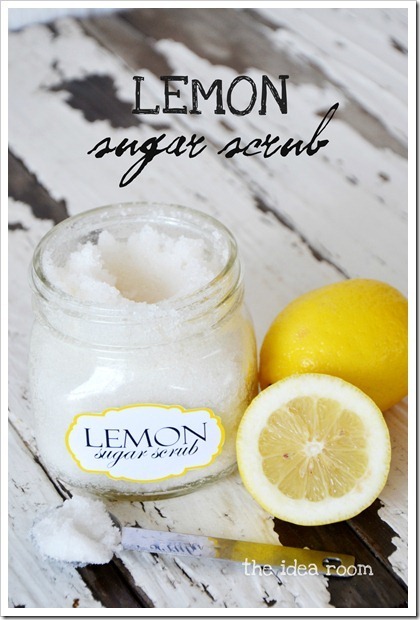 Absolutely love the scrub ideas, especially the lemon scrub.. But could you please send the info. on printing the labels to the email sent above? thank you..
Do you think I can add turmeric powder into ingredient? Yes! That should be fine. I have added some dry spiced before and it seems to work just fine! I can wait to make this scrub. Would you please email me the svg file for the labels? Thanks so much. I have to try this. I’ve recently became obsessed with coconut oil. I have the worst dry skin and I use to use sugar scrubs but found putting a teaspoon of oil in my bath is a miracle worker. Even works well on my eczema hands. Sugar scrub with coconut oil will be a hit with me plus who can resist the lemon scent!! Can’t wait to try! Hi I am using this idea for my gifts this year, LOVE IT!!! Can I use olive oil for the Lemon Sugar Scrub? Yes…but just so you know…it has a darker yellow hue and may turn your scrub off white…but it should work just as well. Your PDF link is no longer available, and I’m making these tonight! Anyway you can send me the link? It’s super cute! Could you use fresh lemon juice. We ave several from our recent veg basket and can’t get through them all! Thank you. I know this is an older post, but if you happen to see this comment can you tell me where you found the jars? They seem like such the perfect size for this project. They are just a canning jar. I think I got it at my local supermarket in the canning section! Hope that helps! I loved this idea! Can you tell me the expiration date? How long does it take to go bad? Yes, this would be a great and inexpensive gift to give. Love this idea! I’m going to make these for Christmas gifts for all the ladies in my family. I need to fill 24 8oz. jars. Any idea how many batches of this recipe I will need so I can plan ahead? Thanks!! This recipe should fill an 8 oz. jar. Such a great gift idea. Hi Amy, you send me the Silhoutte file for the lemon scrub. Thank you so much!